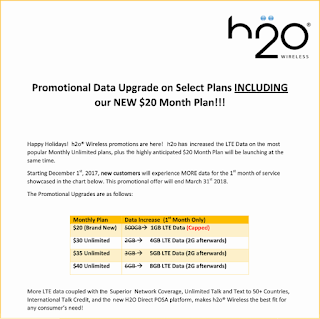 AT&T MVNO H2O Wireless is launching a new $20 plan along with a mew bonus data promotion. The new $20/month plan includes unlimited talk and messaging and 500 MB of hard capped data per month. H2O's "High speed" data is limited to a maximum of 8 mbps for LTE and 4 mbps for HSPA+. Data speeds are throttled to about 128 kbps for the rest of the plan month after the high speed allotment is used. The $20 plan and the bonus data promotion both start of Friday, Dec 1. 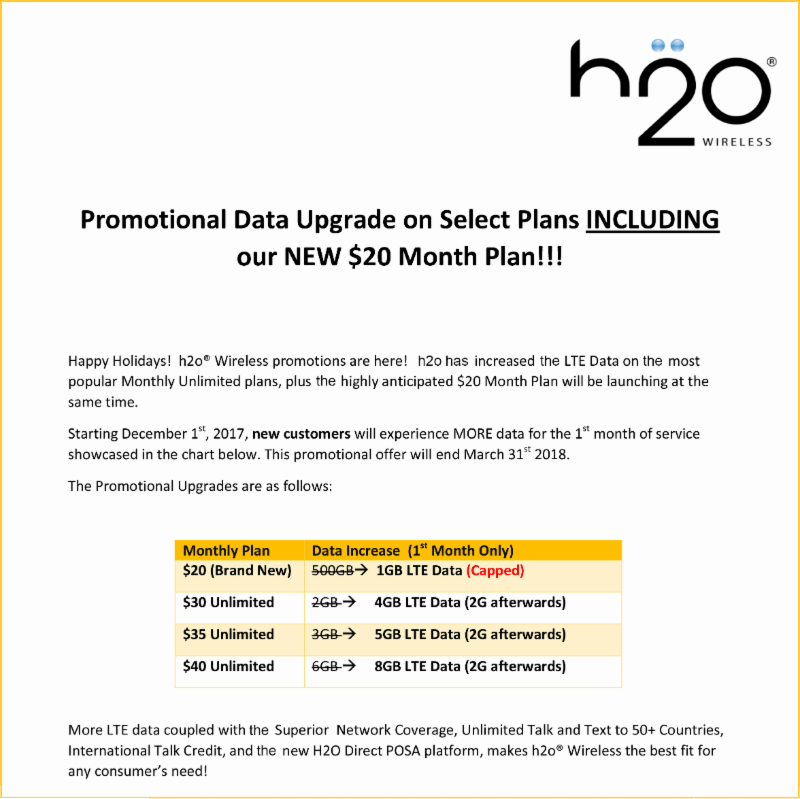 The $20 plan looks like it will be a permanent addition to the H2O line up, the first month bonus data promotion will be available to new customers who activate between December 1, 2017 and March 31, 2018. The new $20 plan is roughly comparable to $20 plans from H2O's fellow AT&T MVNOs Red Pocket Mobile and Pure TalkUSA, which also offer unlimited talk and messaging and 500 MB at the $20 price point. However Red Pocket and Pure Talk's plans have true high speed data without H2O's 8 mbps or 4 mbps throttle. In addition, Pure Talk's $20 plan includes unlimited 128 kbps throttled data after the first 500 MB. I really don't see the appeal of extra data for the first month of service. I think most people use roughly the same amount of data every month, I know I do. Most of the bonus data will likely go unused, or if it is used the customer will probably run out of data in the second and subsequent months. Bonus data for the first month doesn't strike me as much of an incentive for anyone to switch to H20. A more effective promotion would be something every new customer can use like a free or half priced month of service or more data on an ongoing basis. $20 plan at 512 kbps fpr 10 gig and then 128 kbps for the rest. My candid opinion as someone who tried H2O in the past is there are better services out there. Pure talk has much better, Atlanta based CS, at the same price+ unlimited data. Finally the plan for non-smartphone users. But any info about international calling? Same as on other plans? I used H2O many time in the past, I said there are many service much better than H2O. You just have need to do little search.